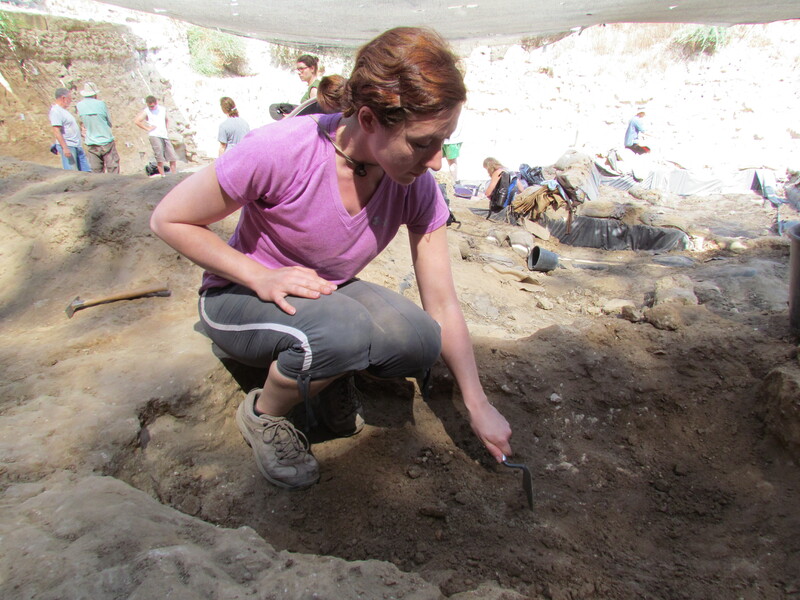 Archaeology is the study of the material remains of humanity (as opposed to paleontology). This is the study of artifacts. 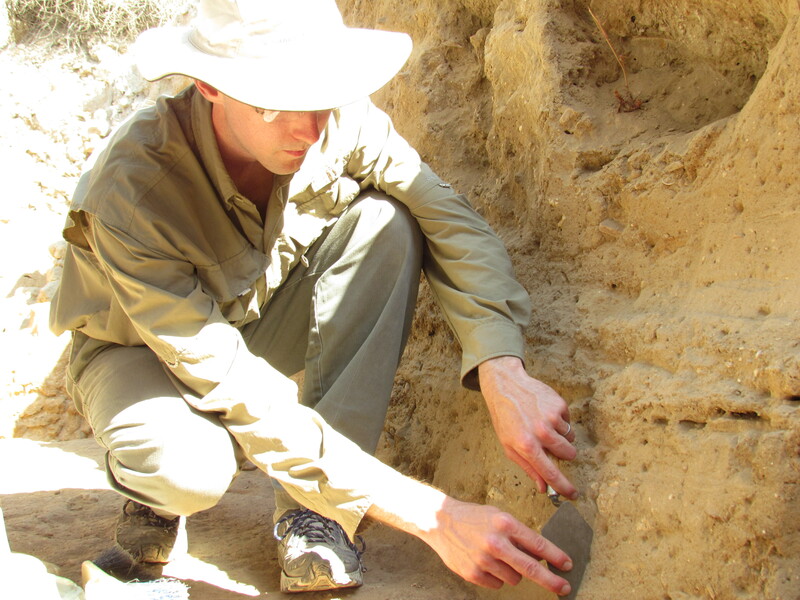 For a Biblical scholar, archaeology reveals the culture and practices behind the Bible narrative. Before your eyes, the Philistines transform from the wicked, Samson-hating enemies of Israel to a sophisticated and powerful people–who were also Israel’s enemies. But how do we get to those awesome artifacts that prove the Philistines weren’t just a bunch of hair-chopping savages? First, one must find the right spot. 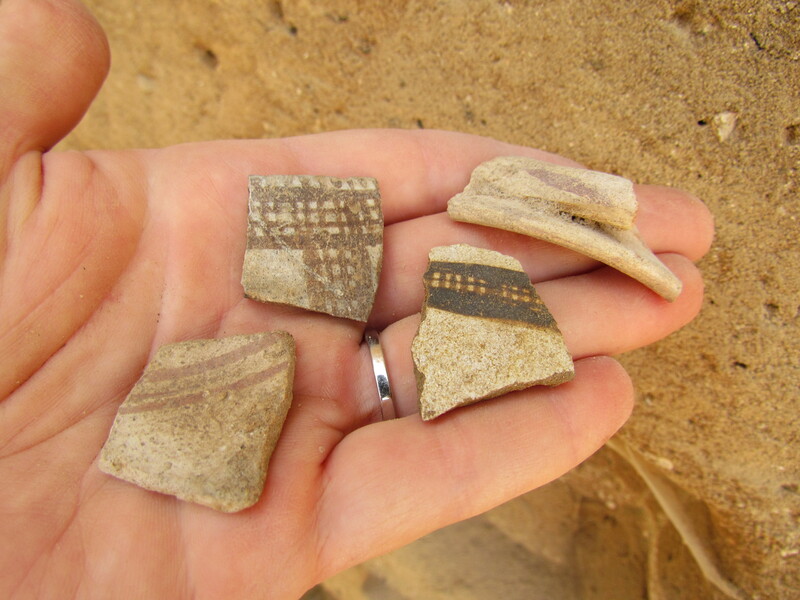 In this case, we’re at Ashkelon, which has maintained its identity through the ages. Archaeologists will divide such a site into grids. Each grid is divided into squares, and these can be divided into units or fine grids for digging. Through the use of technology, such as ground penetrating radar (GPR), archaeologists can get a fairly good bead on where to start in terms of buried architecture. Then, the bulldozers and backhoes come in. Because that’s a lot easier than taking off the top layer ourselves. This is where we get to the fun part. Everyone gets a pickaxe. Some people are really great with pickaxes, some people aren’t, some people are a danger to humanity. At some point during the melee, somone is going to hit some pottery, or a rock, or a brick. Eventually a wall or even a whole complex will begin to emerge. As the work becomes more delicate, so do the tools. Now, you may be down next to a wall, and your supervisor will hand you a patich. This is your little pick that you use to chip away smaller chunks of dirt, rock, and sand. After a bit, you may be right against your wall, or you even found a piece of pottery or bone. So, you take out your handy-dandy trowel–the one you bought off Amazon and schlepped over land and sea just for this moment. With this, you will scrape, carve, and pick at thinner layers, and close in on artifacts. However, if you layer is important, such as floor or fiber (called phytolith), you may use a sophisticated tool like the bamboo skewer to gently lift and flake away dirt. If it’s really close work, they’ll bring out the dental pick instead. And when working with such fragile layers and objects, you can’t simply swipe over it with a brush. You will use an air puffer to puff away those pesky dust particles around your glorious find. Inevitably, though, amongst all this pickaxing, patiching, and trowling, you’ll make a mess. Or your surfaces will get lumpy. Cleanup and leveling is easy with the turia to scrape dirt into buckets and even up your surface. You’ll also use your brush and dustpan to clean up your area. Any pottery goes into a bucket labeled for your particular spot, and bones go into a labeled bag. Really special stuff will be individually packaged and labeled for research. Once everything is labeled, dusted, and tidy, the last tool in an archaeologist’s repetoir is the hot shower. You’ve played with ancient humanity all day, and now it’s time to join your own modern culture again. Happy digging! 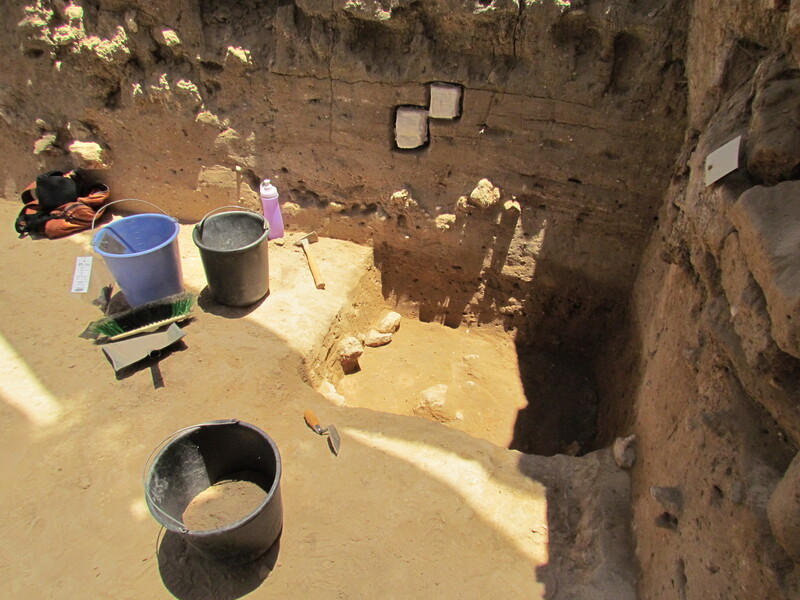 This entry was posted on July 4, 2013 at 1:00 pm and is filed under Biblical Site, Excavations. You can follow any responses to this entry through the RSS 2.0 feed. You can leave a response, or trackback from your own site. How interesting! I am so happy for you both! Since as far back as I can remember I wanted to be an archaeologist!!!!! I am wondering what the white fabric is covering in the wall on the last picture? I love seeing actual pieces of history in your hand! My God watch over you both and keep you in His care. 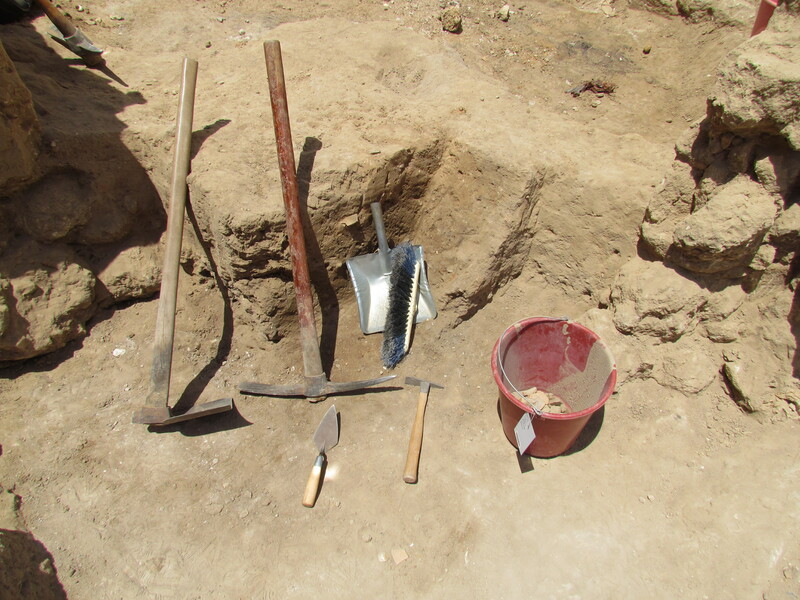 a friend just returned from an excavating trip to Israel where a Turia was used. He said it was a very handy tool and would like to know where to purchase one. Does anyone know where a turia can be bought? Any info is greatly appreciated.